Some of the counts aren’t quite realistic, but the author takes license for the sake of rhyme and rhythm and later explains what the animals are really like. And the actions the animals take are consistent with actions real animals take and kids can identify with. As usual, Morrison’s beautiful illustrations follow the text exactly and enhance the reader’s activities, such as counting the babies and looking for other details. Just like the new verses to the song, there seem to be end to the reading activities available to first graders and up. Along with music for the song, directions are given for dancing to it. 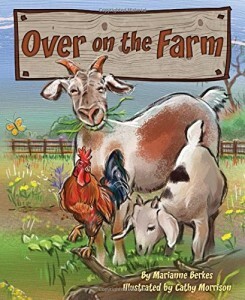 More Fun on the Farm makes many suggestions for further enjoyment of the story. Admit it. You’ve always wondered what IS faster than a speeding bullet. This book will answer that crucial question. Also, what is slower and what goes at the same speed as the bullet. This unique approach allows the reader to learn about the world without really reading. 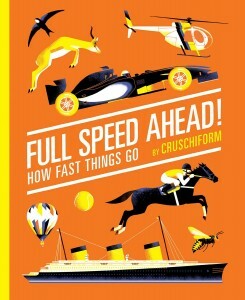 Each two-page spread depicts several objects that travel at approximately the same speed. A legend tells what each object is. The reader can then learn more about each object in the “Glossary” at the back of the book. The approach is multilayered, allowing the reader to come back and learn more later. Colorful illustrations make the process easier. First graders will have fun picking up this book and comprehending that a peregrine falcon moves at the same speed as a high-speed train. They may be curious why the illustration are not to scale, however. A hornet looks bigger than a skydiver. By the way, a shooting star is faster than a speeding bullet. The pictures really make this book stand out. And while it would work as a read aloud in a classroom setting, it is best viewed up close with lots of time to examine each animal. In every picture, the reader is asked to count something or find something or laugh along with the characters. With vibrant use of color, author/illustrator Masayuki Sebe has created simple and lovable cartoon animals that draw readers in with their funny details and amusing mutterings. The final spread shows all 500 animals celebrating at the festival. But the fun is not over. On the very last page, the reader is informed that there are a snail, a ladybug and an ant in every scene – a tactic that is sure to get kids going right back to the beginning to start the count all over again! Originally published in Japanese by Kaisei-sha Publishing Company, 100 Animals on Parade will be well received in North America. The kids who read it and love it won’t even realize they are improving their counting skills – the true measure of a good book. 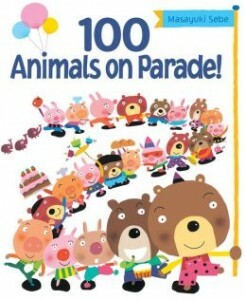 Title: 100 Animals on Parade!